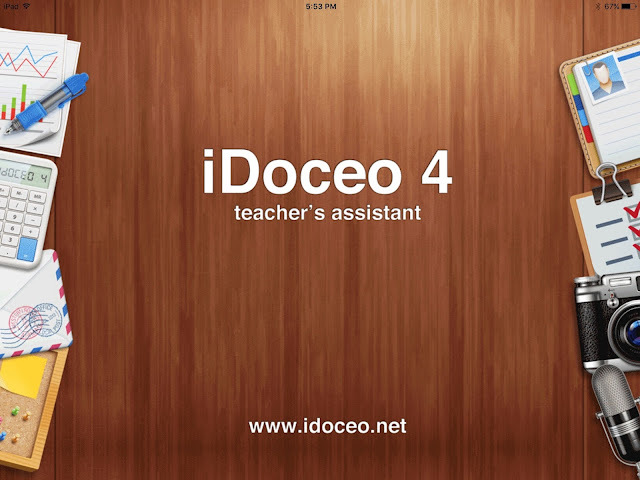 A few months ago, while attending a TCDSB 21C Innovators workshop, I bumped into a former teacher candidate who is now teaching her own class and uses iDoceo 4 for record keeping and planning. It was the first time I had heard of iDoceo and, based on her experience, I thought I would give it a try. Up until that day, I had been using an Excel grade book for recording marks and my day plans were designed using Word. The idea of going paperless and having an electronic grade book has always been appealing to me, especially given the current trends in the education sector. But the fact that I could carry my iPad with me to class, easily record marks and anecdotal observations on the go, and backup my data to Google Drive was something I was willing to spend $13.99 to try. Certainly, with such a high price tag, the iDoceo 4 app would be worth it, right? The first thing I had to do was create my schedule by setting up the various periods and recess blocks before inputting the various classes I teach. I had to make sure this was accurate because the planner is based on this very schedule. It was fairly easy to customize the colours and integrate existing calendars on my iPad. 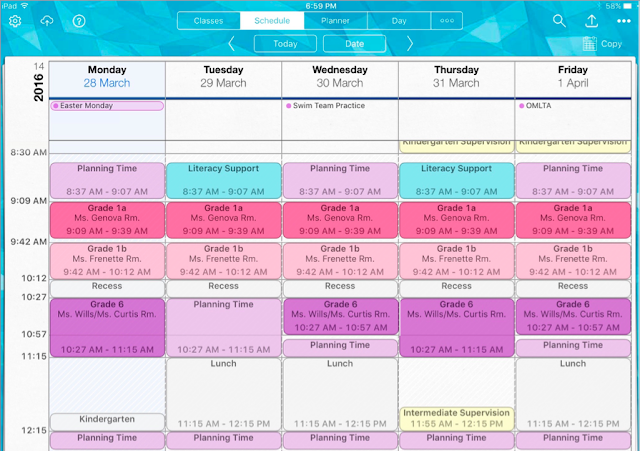 In planner mode, I can click on a class to record plans for the day, copy them to another class, bump them to another day or attach any required resources such as files, notes or photos. Importing the various class lists was easier than I had anticipated since you can import CSV or XLS files. Once imported, I created multiple tabs for the various strands and subjects that I teach and also included one for attendance. For each student, I could include their birthday, e-mail or contact information for their parents but with over 150 students, I decided to pass for the time being. I can also attach resources such as photos of their work or audio or visual recordings of their presentations. Another neat feature is the ability to scan a class photo and, using Face recognition, assign a photo to their student profile. There are so many other great features, such as the ability to e-mail student reports to their parents, and I'm still discovering the many other built-in features. Given that the cost has gone up by three dollars since I purchased it in January, I know it may not be an option for some teachers but I would highly recommend it if you don't mind the cost. 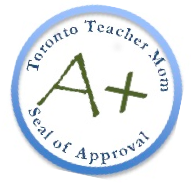 As such, I am giving it the Toronto Teacher Mom Seal of Approval. 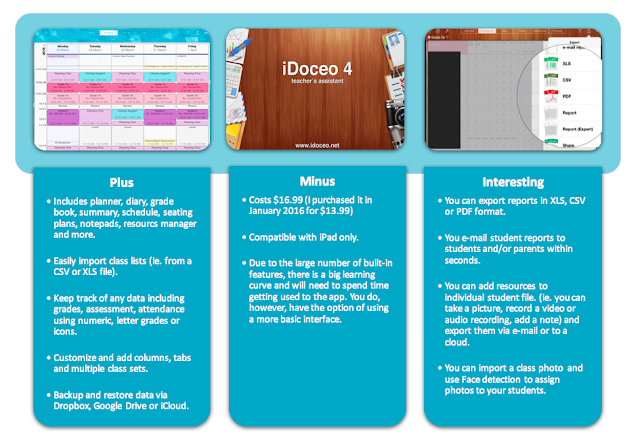 Have you tried iDoceo 4 or any other similar apps for teachers? I'd love to hear your thoughts. This looks like a great app for the teachers, your very own teachers assistance!! I know, right? It's taken some time to get used to but so far I really like it. While this looks cool, I am using Planboard by Chalk.com. It is also supported by our OTF. It's free, has apps for iOS and easy desktop use. Plus you can load the ON curriculum expectations right in the lesson as they are preloaded. I highly recommend it. That's fantastic! My course instructor uses Planboard, too. Will definitely check it out. Thanks! This sounds useful! I've never tried it.